We have just taken delivery of our Winter Mask range. These are the same high quality as our first range launched in the spring. What you'll notice about our masks is the high level of detail and intricate designs that are available. We have owls, peacocks, flowers and more so why not check them out below. 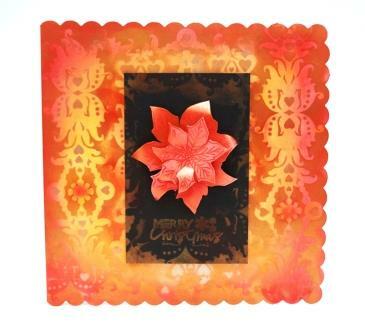 Here is an example of our new Barok border stencil used our Christmas Poisettia stamp and PanPastels and was designed by and produced by Nikky Hall Of Polkadoodles.